General anesthesia, Epidural anesthesia, Post-operative epidural analgesia, Cellular immunity. The influence of anesthesia has been emphasized by a lot of clinicians and can be classified as direct effect of anesthesia, related drugs on the immune cells, and the anesthesia induced indirect regulation of immune system via nervous system and/or endocrine system. Different types of anesthesia and anesthetics may affect the immunity. The killing activity of peripheral natural killer (NK) cells is compromised, total circulating T lymphocytes (CD3+ cells) reduces, ratio of T helper cells (CD4+ cells) to T suppressor cells (CD8+ cells) decreases, and the response of T cells to antigens is also attenuated in patients with malignancies including lung cancer. These cells are important participants of cellular immunity which is crucial for the anti-tumor immunity. These findings suggest that the cellular immunity of patients with malignancies is significantly disrupted. For patients with malignancies, surgery is often a common therapeutic modality in which anesthesia is unavoidable. Thus, to reduce the influence of anesthesia on the immunity of patients in peri-operative period and to increase the post-operative immunity of lung cancer patients have been paid attention to by increasing surgeons and anesthesiologists. To date, a variety of studies have reported the influence of different anesthetics and different types of anesthesia on the immunity of patients, but some focus on intravenous-inhalation combined anesthesia. Some studies have revealed that the influence of anesthetics and anesthesia on the immunity is transient and reversible, and epidural anesthesia has little influence on the immunity of patients as compared with general anesthesia. In the present study, the peri-operative cellular immunity was compared between lung cancer patients who received total intravenous anesthesia combined with intravenous analgesia and those received general anesthesia combined with epidural anesthesia and post-operative epidural analgesia, aiming to verify that anesthesia and analgesia have little influence on the cellular immunity and may achieve rapid recovery in patients receiving radical resection for lung cancer. Propofol (AstraZeneca, Sweden; 50 ml:500 mg; Lot number: KK186), ropivacaine hydrochloride (AstraZeneca AB, Sweden; 75 mg:10 ml), benzenesulfonamide cis atracurium (Jiangsu Hengrui Medicine Co., Ltd; 10 mg; Lot number: 13112517), remifentanil hydrochloride (Yichang Renfu Pharmaceutical Co., Ltd; 1 mg; Lot number: 6130520), midazolam (Jiangsu Enhua Pharmaceutical Co., Ltd; 5 ml: 5 mg; Lot number: 30121015) and sufentanil citrate (Yichang Renfu Pharmaceutical Co., Ltd; 1 ml: 50 mg; Lot number: 1131003) were used in this study. Disposable anesthesia puncture package (epidural anesthesia package) (AS-E; Zhejiang Fert Medical Devices Co., Ltd), infusion pump for analgesia (TCI-III; Nantong Apon Medical Appliance Co., Ltd), anesthesia workstation (Datex-Ohmeda Aestiva 3000; Finland), and bispectral index (BIS) monitor (Aspect VISTA EEG Monitor; Aspect, USA) were used in this study. Flow cytometer (FACS Calibur; Becton Dickinson, USA), lymphocyte subset detection kit (Smultest IMK-Lymphocyte), mouse anti-human monoclonal antibodies (catalog No.340182, Pujian Biology and Technology Ltd., Wuhan, China), low temperature centrifuge (sigma1-15K), laminar flow clean bench (Suzhou Purification equipment company and ultra-low temperature freezer (Thermo Forma, USA) were used in this study. This study was approved by the Institutional Review Board of our hospital, and informed consent was obtained from each patient before study. 48 patients were randomly chosen, among whom 8 were excluded, and 40 meet the inclusion criteria. A total of 40 lung cancer patients aged 45-68 years who received elective thoracotomy were recruited into the present study. The American Society of Anesthesiologists (ASA) class was I-II and the body mass index (BMI) was <30 kg/m2. There were no heart, liver, kidney and coagulation dysfunction, no anemia, as well as no abnormalities of immune system, endocrine system and circulation system. ASA I was defined that patients have normal function of important organs or systems, who can tolerate anesthesia and surgery without almost any risk. ASA II was defined that patients have mild systemic diseases, mild abnormalities of important organs but with found compensatory function, who can tolerate come anesthesia and surgery without few risks. In this study, patients with ASA II were mainly with mild respiratory diseases, mildly abnormal respiratory function, while can tolerate come anesthesia and surgery. These patients had neither received any radiotherapy or chemotherapy before surgery, nor treated with non-steroidal anti-inflammatory drugs, hormones and immunosuppressants prior study. Besides, they had no spinal deformity. Patients were randomly divided into two groups: patients in Group I received total intravenous anesthesia combined with intravenous analgesia and those in Group II received general anesthesia combined with epidural anesthesia and postoperative epidural analgesia (n=20 per group). Patients were transferred into operation room where they were allowed to calm for 5 min. Then, the blood pressure (BP), heart rate (HR), mean arterial pressure (MAP) and terminal oxygen saturation (SpO2) were measured as baseline values. Anesthesia in Group I: After establishment of venous access, general anesthesia induction was performed with Midazolam (0.05 mg/kg), remifentanil (target concentration: 6 ng/ml), propofol (target concentration: 6 ug/ml) and cis atracurium (0.1-0.15 mg/kg). At the same time, patients received mechanical ventilation after endotracheal intubation with the tidal volume at 8-10 ml/kg and respiration rate at 12-13 breaths/min. After thoracotomy, one-lung ventilation was employed with an increase in respiration rate by 20% and reduction in tidal volume by 20%. In surgery, the target concentration of propofol was controlled at 3-6 μg/ml and that of remifentanil at 4-6 ng/ml. Cis atracurium was intermittently injected at 0.05 mg/kg for the maintenance of muscle relaxation, parecoxib (40 mg) was administered for analgesia and palonosetron (0.2 mg) was injected for the prevention of vomiting. The anesthesia depth was monitored with the Aspect VISTA EEG monitor. The propofol concentration was adjusted to maintain BIS at 40-60. According to the hemodynamics, the remifentanil concentration was adjusted to maintain the blood pressure and heart rate not higher or lower than 1.2 times that at baseline. 30 min before the end of surgery, patient-controlled analgesia (PCA) pump containing 3 μg/kg sufentanil in 150 ml was connected. Sufentanil at a loading dose (5 ml; 0.1 μg/kg) was administered, followed by infusion at a speed of 2 ml/h. For the PCA, the bolus was 2 ml and the time of infusion was 15 min. Demand administration of analgesia was performed in recovery room and ward. Methods of anesthesia in Group II: After the establishment of intravenous access, epidural puncture was done at T7-T8. Then, a tube was inserted 5 cm from the cephalic side. 1% lidocaine was epidurally injected at a tentative dose of 5 ml. Five minutes later, the anesthesia level was determined. General anesthesia induced was performed as in Group I when the anesthesia level was at T4-T8 and no sign of whole spinal anesthesia. 0.375% ropivacaine (3-5 ml) was administered epidurally before surgery and then once every 30 min during surgery. The concentration of propofol and remifentanil was controlled, and cis atracurium was intermittently infused. Other procedures were identical to those in Group I. About 30 min before the end of surgery, additional ropivacaine was administered, and PCA pump with 3 μg/kg sufentanil and 0.2% ropivacaine (300 ml) was connected, and infusion was done at a speed of 4 ml/h. The bolus was 4 ml and time of infusion was 15 min for PCA in recovery room and ward. There was no failed epidural anesthesia. The BP, HR, MAP and SpO2 were monitored once every 5 min. The SpO2 was maintained at higher than 95%. Patients with SpO2 lower than 95% were withdrawn from this study. The time of operation and dose of propofol, remifentanil and ropivacaine were recorded. Patients receiving blood transfusion during or after surgery were excluded from this study. The intra-operative awareness was reviewed by interviewing, analgesia efficacy was evaluated with VAS score (0, no pain; <3, excellent; 3-4, satisfactory; 4-6, effective; >6, ineffective). The adverse effects were recorded such as dizziness, headache, nausea, vomiting and hypotension. Blood (2 ml) was collected from the right internal jugular vein or subclavian vein before anesthesia (T0), and immediately (T1), 24 h (T2) and 72 h (T3) after surgery. Blood was anti-coagulated with ethylene diamine tetraacetic acid (EDTA) and then processed for detections. Flow cytometry was performed with FACS Calibur flow cytometer, Smultest IMK-Lymphocyte kit and mouse anti-human monoclonal antibodies (catalog No.340182). In brief, 20 μl of monoclonal antibody was added to a tube, followed by addition of anti-coagulated blood (100 μl). Incubation was done at room temperature for 30 min in dark. After two additions of hemolysin (2 ml), incubation wad done in dark for 5 min at room temperature. After centrifugation at 1200 rpm for 5 min, the supernatant was removed, and PBS was added for re-suspension. Following centrifugation at 1200 rpm for 5 min, the supernatant was removed, and 300 μl of fixation solution was added, followed by flow cytometry. After fluorescent compensation, detection was performed. Data were processed with supplied System II software. Quantitative data are expressed as mean ± standard deviation. Statistical analysis was performed with SPSS version 17.0. Repeated measures analysis of variance was employed for comparisons of data at different time points in the same group and those at a specific time points among groups. A value of P<0.05 was considered statistically significant. There were no significant differences in the age, gender, BMI, time of operation and doses of propofol and ropivacaine (P>0.05). The dose of remifentanil in Group II was significantly lower than that in Group I (P<0.05) (Table 1). Table 1. General characteristics of patients (n=20). Significant differences were not observed in the HR, BP, MAP, SpO2 and BIS on transferring into operation room, after endotracheal intubation, on skin incision, on thoracotomy, immediately after surgery and after extubation. No intra-operative awareness was found in both groups. VAS score was significantly different between the two groups (Table 2). Notes: There was no intra-operative awareness in post-operative follow up. At 24 h after surgery, the VAS score in Group II was significantly lower than in Group I (P<0.01). Table 2. VAS score in two groups at 24 h after surgery. There was significant difference of CD3+ cells, CD8+ cells, CD4+/CD8+ ratio, and NK cells (P>0.05) between two groups. The T cell subsets were examined in the two groups. CD8+ cell increased after surgery and peaked at T2 (P<0.01), but other parameters reduced significantly (P<0.05). The CD3+ cells and CD4+ cells reached the lowest level at T1 (P<0.01), but increased at T2. The CD4+ /CD8+ ratio and NK cells were the lowest at T2. In Group I, parameters (except for NK cells) at T3 were significantly different from those at T0 (P<0.01). In Group II, the parameters returned to baseline levels at T3 (P>0.05). Significant differences were observed in the CD3+ cells, CD8+ cells, and CD4+/CD8+ ratio at T3 between two groups (P<0.05) (Figures 1-5). Figure 1. CD3+ cell proportion at different time points after surgery. **P<0.01, T0 vs. other points in the same group; #P<0.05 at T3 between the two groups. The CD3+ cell proportion reached the lowest level at T1. In Group II, CD3+ cell proportion at T3 increased to the preoperative level, showing no significant changes with T0. However, T3 was significantly lower than T0 in group I. 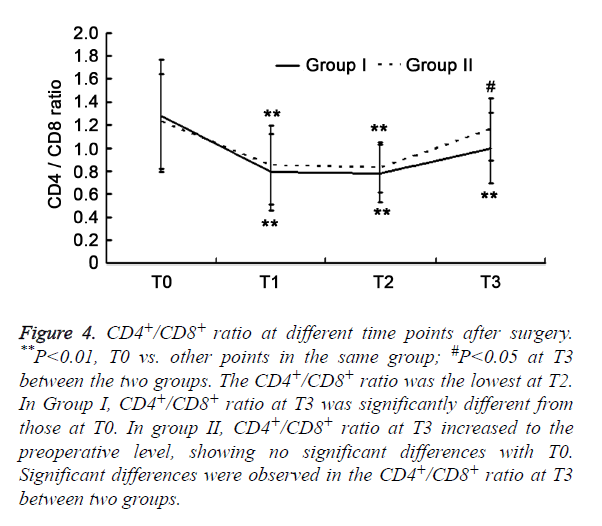 Significant differences were observed in the CD3+ cell proportion at T3 after surgery between two groups. Figure 2. CD4+ cell proportion at different time points after surgery. **P<0.01, T0 vs. other points in the same group. The CD4+ cell proportion reached the lowest level at T1. In Group I, CD4+ cell proportion at T3 was significantly different from those at T0. In group II, CD4+ cell proportion at T3 increased to the preoperative level, showing no significant differences with T0. Figure 3. CD8+ cell proportion at different time points after surgery. *P<0.05, **P<0.01, T0 vs. other points in the same group; #P<0.05 at T3 between the two groups. CD8+ cell proportion increased after surgery and peaked at T2. 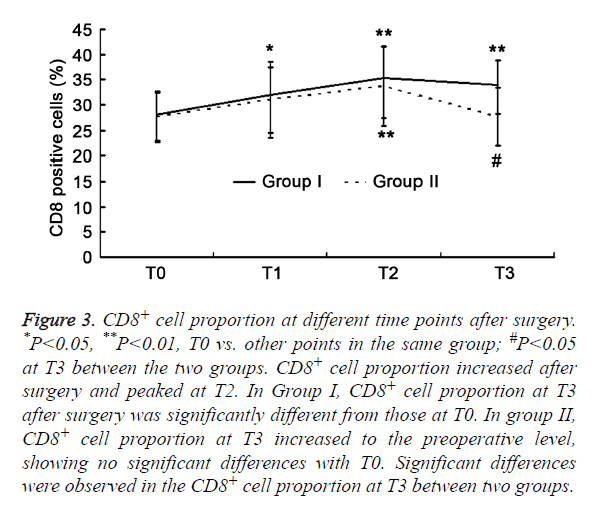 In Group I, CD8+ cell proportion at T3 after surgery was significantly different from those at T0. In group II, CD8+ cell proportion at T3 increased to the preoperative level, showing no significant differences with T0. 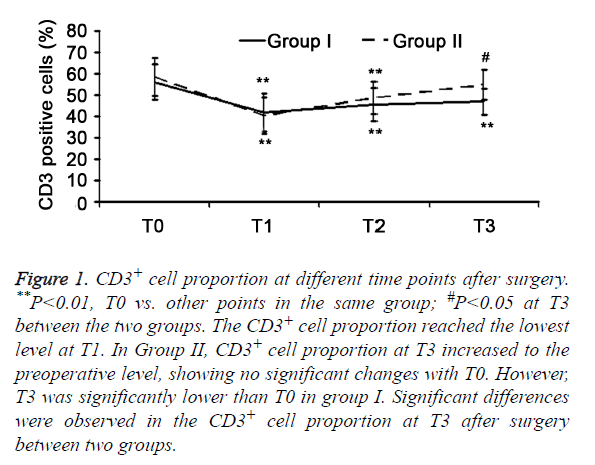 Significant differences were observed in the CD8+ cell proportion at T3 between two groups. Figure 4. CD4+/CD8+ ratio at different time points after surgery. **P<0.01, T0 vs. other points in the same group; #P<0.05 at T3 between the two groups. The CD4+/CD8+ ratio was the lowest at T2. In Group I, CD4+/CD8+ ratio at T3 was significantly different from those at T0. In group II, CD4+/CD8+ ratio at T3 increased to the preoperative level, showing no significant differences with T0. Significant differences were observed in the CD4+/CD8+ ratio at T3 between two groups. Figure 5. NK cell proportion at different time points after surgery. *P<0.05, **P<0.01, T0 vs. other points in the same group. The NK cell proportion kept decreasing, and was the lowest at T2. In both groups, NK cell proportion at T3 increased to the preoperative level, showing no significant differences with T0. No significant differences were observed in the NK cell proportion at T3 between two groups. Patients with malignancies usually have immune dysfunction. Surgery is an important strategy for the therapy of malignancies. Any major surgery may cause inflammatory reaction in peri-operative period, which may result in immunosuppression. Some factors have been found to influence the inflammatory reaction, such as surgery induced stress, use of anesthetics, hypothermia, mechanical ventilation and pre-existing diseases . Anesthesia may attenuate the surgery induced stress and alleviate the secondary immunosuppression. However, anesthesia and anesthetics themselves may also affect the immune function of patients, which also significantly influences the therapy and prognosis of patients. The cellular immunity (especially the NK cell function) in lung cancer patients is significantly inhibited in peri-operative period as compared with healthy controls and other patients with malignancies . In addition, thoracotomy is also a surgical trauma and may induce strong stress. Thus, it is imperative to protect the lung cancer patients from surgery induced stress in peri-operative period. However, the influence of anesthesia and surgery on the immune system and inflammatory reaction may not be neglected although the current anesthesia has a high safety. In the present study, the immune function was compared between lung cancer patients receiving total intravenous anesthesia combined with intravenous analgesia and those receiving general anesthesia combined with epidural anesthesia and post-operative epidural analgesia in the peri-operative period, aiming to find a better method of anesthesia for the radical resection for lung cancer. Thoracotomy is also a surgical trauma. Total intravenous anesthesia may not completely inhibit the secretion of stress related hormones in the pituitary and adrenal glands secondary to operations in anesthesia and surgery, but deeper anesthesia may cause severe cardiovascular complications such as myocardial suppression and arrhythmia. Of note, this type of anesthesia is still currently used in clinical practice. Epidural anesthesia may block peripheral nerves, reduce the stress of neuroendocrine system, and block the transmission of noxious stimulus to the central system, which are beneficial for the post-operative recovery. On the other hand, the vascular dilation in blocking area is helpful for the BP control and beneficial for the elderly with hypertension. Ahlers et al. found that epidural anesthesia could reduce the blood catecholamines and cortisol and increase blood lymphocytes as compared with intravenous anesthesia. Some investigators [4,5] also found that Regional blocking (including epidural blocking) may reduce the dose of intravenous anesthetics, attenuate surgery induced stress, decrease the consumption of opioids, maintain the CD4+/CD8+ and alleiviate the influence of surgery on the number and function of NK cells. Vanni et al. [2,6,7] also found that NK cells were reduced in lung cancer patients who received intravenous anesthesia for open surgery, but the proportion of NK cells remained in those who received epidural anesthesia for endoscopy. This suggests that regional blocking and attenuation of surgery induced stress are protective on the postoperative immune function of patients. In addition, a variety of clinical studies have revealed that epidural blocking combined general anesthesia is able to attenuate pain induced stress in peri-operative period and also improve the peri-operative immunosuppression as compared with general anesthesia alone [8-10]. Of note, the “anti-cancer anesthetic technique” was proposed in the conference of the European Society of Anesthesiologists (ESA), aiming to find an optimal method of anesthesia for cancer patients. After reviewing literature, it was speculate that regional anesthesia is superior to general anesthesia in preserving anti-tumor immunity, and general anesthesia combined with regional anesthesia is also superior to general anesthesia alone. However, whether this can be called “anticancer anesthetic technique” and what the mechanism of anticancer effects is are required to be further confirmed in basic studies and prospective clinical studies with large sample size . In both groups of this study, CD3+ cells, CD4+ cells, CD4+/ CD8+ and NK cells reduced at T1 and T2 as compared with baseline levels. This suggested that anesthesia and the surgery induced changes in endocrine system caused the alteration of immune function. However, intergroup comparisons showed no significant differences. This might be explained that surgery induced stress, long operation time, and high dosage of anesthetics concealed the advantages of intravenous combined epidural anesthesia. However, when the influence of above factors were subsided, the immune function recovered more rapidly in Group II, and the CD3+ cells, CD8+ cells, CD4+/ CD8+ and NK cells at T3 increased to those at T0, and significant differences were still observed between two groups in these parameters at T3 (Figures 1-5). Beilin et al. investigated the influence of post-operative analgesia with different methods on the immune function. Results showed the proliferation of lymphocytes to mitogen in epidural analgesia group was significantly higher than in intravenous analgesia group. Mrako et al. found the number of NK cells in colon cancer patients receiving post-operative epidural analgesia was higher than that in those receiving intravenous analgesia, suggesting that epidural analgesia has little influence on the post-operative suppression of NK cells. Gu et al. also found that the reduction of CD4+/CD8+ in patients receiving intravenous analgesia was larger than that in those undergoing epidural analgesia. This may be explained as that general anesthesia may inhibit the cerebral cortex limbic system and hypothalamic cortical projection system, but fails to effectively block the transmission of noxious stimuli to the central system. Thus, elegant post-operative analgesia may reduce the peri-operative immunosuppression, leading to reduced risk for cancer metastasis. These are consistent with the rapid recovery of immune function in Group II in this study. The drugs vary among different types of anesthesia and analgesia. In the present study, propofol and remifentanil were infused, and sufentanil (an opioids) was used for post-operative analgesia in both groups. However, in Group II, ropivacaine was used for epidural anesthesia. Propofol has anti-inflammatory and anti-oxidative activities and can induce the protective immunity. Remifentanil acts rapidly, but its half life is short. Its analgesic effect disappears within 5-10 min. Infusion of propofol and remifentanil is able to effectively maintain the hemodynamics and reduce the surgery induced stress and immunosuppression in patients . Before the end of surgery, additional sufentanil at a loading dose was administered for post-operative analgesia, which is commonly used in our department. Sufentanil is a potent analgesic of opioid family, but its influence on the immune function is still controversial when it is administered for post-operative analgesia. In recent years, increasing studies reveal that sufentanil is protective on the cellular immunity to a certain extent [15,16], which is comparable to the protective effect of tramadol, a non-opioid drug with little influence on the immune function . Ropivacaine is a new, long acting amide used for local anesthesia. There is evidence showing that continuous epidural infusion of 0.75% ropivacaine may significantly increase the response of T lymphocytes in patients receiving spinal surgery , suggesting the absence of suppressive effect of ropivacaine on the T lymphocytes. In this study, 0.375% ropivacaine was used for epidural analgesia, which reduced the dose of opioids and decreased VAS score in post-operative epidural analgesia. This not only achieves favorable analgesia, but is beneficial for the post-operative recovery of immune function. There were still limitations in this study. Blindness was not included in the study design. In addition, the doses of propofol and remifentanil were mainly adjusted according to the individual experience and patients’ clinical manifestations although BIS value was also used as a reference, and thus there was still difference in them between two groups. In addition, thoracotomy may cause a major trauma to patients, the operation time is long, and the dose of anesthetics is large, all of which may influence the immune function. This might conceal the difference in influence of anesthesia with different methods on the immune function. Moreover, the hospital stay of these patients is short and the time of study is limited. In the future study, the long term influence of anesthesia with different methods on the immunity is required to be investigated. For lung cancer patients with severe immune dysfunction, general anesthesia combined with epidural anesthesia and post-operative epidural analgesia has little influence on the immune function and may achieve a rapid recovery after surgery. Thus, general anesthesia combined with epidural anesthesia was preferred. Cata JP, Gottumukkala V, Sessler DI. How regional anesthesia might reduce postoperative cancer recurrence. Eur J Pain Suppl 2011; 5: 345-355. Cata JP, Bauer M, Sokari T, Ramirez MF, Mason D, Plautz G, Kurz A. Effects of surgery, general anesthesia, and perioperative epidural analgesia on the immune function of patients with non-small cell lung cancer. J Clin Anesth 2013; 25: 255-262. Ahlers O, Nachtigall I, Lenze J, Goldmann A, Schulte E, Hohne C, Fritz G, Keh D. Intraoperative thoracic epidural anaesthesia attenuates stress-induced immunosuppression in patients undergoing major abdominal surgery. Br J Anaesth 2008; 101: 781-787. Wada H, Seki S, Takahashi T, Kawarabayashi N, Higuchi H, Habu Y, Sugahara S, Kazama T. Combined spinal and general anesthesia attenuates liver metastasis by preserving TH1/TH2 cytokine balance. Anesthesiology 2007; 106: 499-506. Conrick-Martin I, Kell MR, Buggy DJ. Meta-analysis of the effect of central neuraxial regional anesthesia compared with general anesthesia on postoperative natural killer T lymphocyte function. J Clin Anesth 2012; 24: 3-7. Ng CS, Lee TW, Wan S, Wan IY, Sihoe AD, Arifi AA, Yim AP. Thoracotomy is associated with significantly more profound suppression in lymphocytes and natural killer cells than video-assisted thoracic surgery following major lung resections for cancer. J Invest Surg 2005; 18: 81-88. Vanni G, Tacconi F, Sellitri F, Ambrogi V, Mineo TC, Pompeo E. Impact of awake videothoracoscopic surgery on postoperative lymphocyte responses. Ann Thorac Surg 2010; 90: 973-978. Mrakovcic-Sutic I, Bacic D, Golubovic S, Bacic R, Marinovic M. Cross-talk between NKT and regulatory T cells (Tregs) in modulation of immune response in patients with colorectal cancer following different pain management techniques. Coll Antropol 2011; 35: 57-60. Martin-Canal G, Saavedra A, Asensi JM, Suarez-Zarracina T, Rodriguez-Guardado A, Bustillo E, Fierer J, Carton JA, Collazos J, Asensi V. Meropenem monotherapy is as effective as and safer than imipenem to treat brain abscesses. Int J Antimicrob Agents 2010; 35: 301-304. Ding JW, Pu JB. Effects of different anesthesia methods on perioperative immune function of patients with gastric cancer undergoing radical resection. J Clin Exp Med 2013; 12: 1399-1400. Liang M, Jiang YL, Zhou DC. Application of anticancer anesthetic technique in anesthesia of cancer patients. Nat Med J Chi 2010; 90: 1941-1943. Beilin B, Hoofien D, Poran R, Gral I, Grinevich G, Butin B, Mayburd E, Shavit Y. Comparison of two patient-controlled analgesia techniques on neuropsychological functioning in the immediate postoperative period. J Clin Exp Neuropsychol 2008; 30: 674-682. Gu CY, Shen LR, Ding YH, Lou Y, Wu HG, Shi Z, Ma XP. Effect of different anesthesia methods on immune function in patients of laparoscopic cholecystectomy in peri-operational period. Zhongguo Zhen Jiu 2011; 31: 236-240. Ji M, Tao J, Wang QL, Li BX. Influence of target controlled infusion with propofol combined with remifentanil on immune and stress reaction. Med J Nat Defen Forc Southw Chi 2013; 23: 499-502. Zheng ZX, Cao G, Yuan CZ. Effect of sulfentanyl on cellular immune function and hormonal level in patient with esophagus cancer during operation. Chin J Hosp Pharm 2013; 33: 890-893. Wu WD. The Effects of Sufentani and Fentanyl Intravenous Analgesia on the T-lymphocyte Subsets in Patients with Gastric Cancer after Radical Operation. J Hubei Univ Nation 2012; 29: 31-33. Hu CH, Hu GY, Fu L, Xu J, Chen YL, Wu JQ. The effects of tramadol or sufentanil on immune function during postoperative anagesia. Zhejiang J Traum Surg 2012; 17: 302-304. Xu MQ, Huang YH, Zhang Z, Zhang WP, Liu WY. The Effects of Ropivacaine on the Content of CD3 CD4 CD8 CD20 IL-2 INF-α. Hubei Med 2005; 11: 774-776.